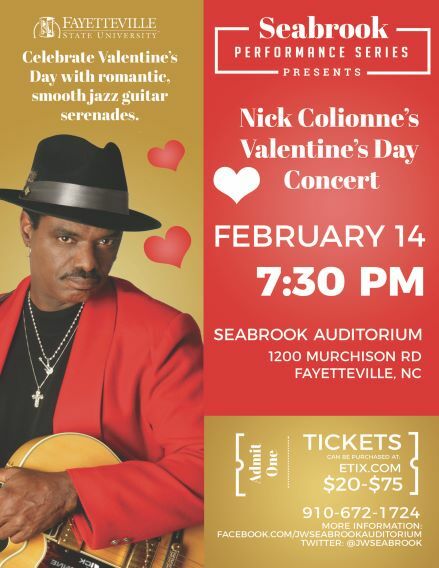 Romantic, silky smooth jazz guitar serenades will set the mood for a special Valentine’s Day Concert featuring the extraordinary sounds of Nick Colionne, on Feb. 14, at Fayetteville State University’s (FSU) Seabrook Performance Series (SPS), 7:30 p.m., in J.W. Seabrook Auditorium on the FSU campus. Colionne is distinguished as the only artist in the history of the smooth jazz genre to score five consecutive number one hit singles on Billboard. Since breaking through to contemporary urban jazz stardom in the early 2000s, Colionne has been one of the genre´s most dynamic and tireless live performers, headlining hundreds of shows and energizing fans across the U.S. and Europe with his sizzling blend of jazz, R&B, funk, blues and soulful, seductive vocals. Over the years, the charismatic, inspirationally fashionable (courtesy of designer Stacy Adams) Chicago-based guitarist´s album titles have kept everyone in the loop as to where his musical heart is. He has mastered the art of "Keepin´ It Cool" (2006), pushed musical boundaries to a place where there are "No Limits" (2008), urged us to "Feel The Heat "(2011) and later explored some of his deepest "Influences" (2014). On his 2016 album, The Journey, Colionne took stock of his extraordinary career, the wonderful musicians he´s played with, the people he´s entertained, and the amazing places he´s traveled. It´s taken him to great heights, as the three Top 5 singles from "Influences" led him to be named Billboard´s #5 Artist of the Year for 2015. Colionne keeps the forward momentum going with the infectious and grooving title track and lead single from "The Journey." Upon its recent release, it earned a "#1 Most-Added" designation on iTunes and Billboard, and quickly reached #1 on the Billboard Smooth Jazz and Groove Jazz Music charts. One of the most in-demand headliners on the smooth jazz circuit, Colionne plays up to 75 shows a year throughout the country at top festivals (Berks Jazz Fest, Capital Jazz Fest, Catalina Jazz Trax Festival, Seabreeze Jazz Festival, JazzFest West, Punta Gorda Jazz Festival, Thornton Winery Jazz Series), on popular cruises (Capital Jazz Cruise, The Smooth Jazz Cruise, Dave Koz Cruise) and in other top venues. Expanding his reach to Europe in recent years, Colionne has performed several times at the Smooth Jazz Festival Augsburg in Germany, the Mallorca Smooth Jazz Festival and Pizza Express Jazz Club in London. Influenced as a child by jazz guitar legend Wes Montgomery, Colionne has received numerous accolades throughout his multi-faceted career, including the 2007 International Instrumental Artist of the Year Award at the Wave Jazz Awards, where he succeeded 2006 winner Chris Botti. He was also chosen Artist of the Year at the 2011 Rehoboth Beach Jazz Festival and Performer of the Year for Jazz Trax Jazz Festivals in 2010 and 2011. In 2010, Colionne was nominated as Guitarist of the Year and Entertainer of the Year by the American Smooth Jazz Awards and received the Wayman Tisdale Humanitarian Award for his ongoing commitment to mentoring children, his work in the community and nationally in support of breast cancer causes. The recipient of the 1996 Malcom X College Alumnus of the Year Award (he earned his degree there in music), Colionne has devoted much of his spare time over the past 20 years to mentoring children at St. Laurence K-8 School in Elgin, Illinois. His roles include counseling, teaching music, computer music skills and guitar, and producing talent shows and holiday pageants. Tickets cost $20 to $75. To purchase tickets call 910-672-1724 or visit: http://bit.ly/2AhzNq5. For information on all Seabrook Performance Series events, follow us on twitter: @jwseabrook or facebook.com/jwseabrookauditorium.